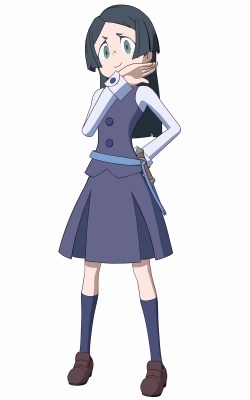 Barbara Parker is a character from Little Witch Academia. She shares a higher class dorm room at Luna Nova academy with Hannah England and Diana Cavendish which has a Clawfoot Slipper Bathtub and Shower Combo. Barbara keeps her hair down when she takes a Bath. She takes an Off Screen Bath with Hannah England and is seen wearing a Towel dripping wet because the bath got cold from Luna Nova's magic being taken. she manages to bribe a fire spirit to allow both her and Hannah England to take a hot Bath. They both share a Shower Bath together in their dorm room's Clawfoot Slipper Bathtub but when the fire spirit gets extinguished, their bath turns cold and they run out screaming in Bathrobes making it known they broke the strike which makes chaos happen throughout the school. This page was last modified on 6 June 2018, at 08:35.